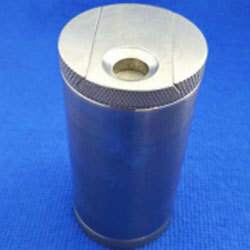 We ''Canada'' based manufacturers and exporters of Tungsten alloy or related products are offering an advance variety of Tungsten (Wolfram) Vial Shield. It is especially designed by using high grade alloy of tungsten under the latest technology. Like TVS Tungsten Vial Shield, this Tungsten (Wolfram) Vial can also be loaded from the shield's top or bottom. It is especially constructed to reduce the exposure of vials. Offered product is available with the dimensions of 1.44" dia x 2.8" h (3.7 x 7 cm) along with the Lead Equivalency of 38" (1 cm) Weight: 1.65 lb (0.75 kg) .